Hemp oil is a fantastic natural supplement to your beauty and hygiene routine. Like olive and avocado oil, it has a naturally green color due to its chlorophyll content, which makes it an excellent anti-inflammatory oil. Many people use hemp oil in the kitchen because of its nutty, earthy flavor, but hemp oil is also a fantastic beauty product. If you enjoy using it in your cooking, try some new ways to use hemp oil outside the kitchen! Why not just use hemp oil in the kitchen, you ask? Applying natural treatments to the skin topically allows for maximum absorption and benefits, since the skin is the largest organ we have. This is just one reason it’s important to avoid chemical treatments and commercial beauty products. What we put on our skin goes into our bloodstream and organs. Therefore, what is good for your body internally is the best for it externally, too. So let’s take a look at why hemp oil is one of the best natural beauty aids of all time and the most beneficial ways to use it, shall we? Hemp oil is rich in specific fats that make it especially nourishing to the brain — and also to the body. These beneficial fats include omega 3, 6 and 9, which are all vital for obtaining a well-rounded essential fatty acid profile. You may have heard that omega-6 fats can have an inflammatory effect on the body. This generally refers to sources from processed foods that contain very refined vegetable oils, or fats from conventionally-farmed animals that are fed a diet full of GMO grain, corn and soy. However, hemp oil is different; it contains a specific type of omega-6 fat known as GLA, which stands for gamma linolenic acid. This type of fat is actually fantastic for metabolism and maintaining hormonal balance. It’s also very healing to the skin and promotes a youthful glow. Hemp oil is a great source of magnesium, which relaxes muscles, cools inflammation and prepares the body for rest and rejuvenation. Magnesium also helps relieve cramps or muscle aches, which is great if you exercise on a regular basis. Hemp seeds are one of the highest plant-based sources of magnesium, and though the oil is not quite as high, it still retains much of the nutrition found in the seed because the oil is cold-pressed, leaving all the nutrients intact. Magnesium is also an important mineral to nourish the nervous system, promote a healthy digestive system, and promote relaxation to help you sleep. One way to maximize the benefits of using hemp oil for this purpose is to first take a warm bath in Epsom salts, which are pure magnesium salts. Then dry off and moisturize your body with hemp oil. This is such a relaxing way to wind down before bed, and it makes your skin look amazing too. You’ll sleep better than ever! Because hemp oil is very soothing to the skin and very cooling, it can also help relieve dermatitis and eczema. Many women and men take vitamin E to promote healthy hair growth or silky hair. 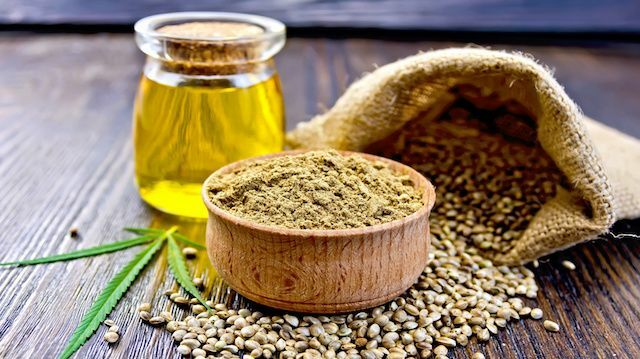 A better option than buying pricey vitamin E capsules at the store is to simply rub hemp oil all through your hair a few minutes before you shower and wash your hair. Around a tablespoon of the oil is all it takes — you want to coat your hair but not saturate it. Using hemp oil on your hair will help make it silky, strong and will even help it grow! Hemp oil is also excellent as a beauty treatment due to its high vitamin E content. Use just a tiny bit under your eyes and eyelids instead of harsh wrinkle cream. Hemp oil’s anti-inflammatory properties combined with vitamin E will help promote healthy, youthful skin and reduce wrinkles. Hemp oil is also very moisturizing to the skin and absorbs better than olive or avocado oil. For this reason, it makes an excellent makeup remover and face cleanser. If you’re prone to acne, you’ll want to use hemp oil only for removing makeup, and then finish with an apple cider vinegar/lemon juice toner, which will help cleanse the skin of excess oil and bacteria but won’t promote dryness. Hemp oil is better to use than makeup removers because it’s very nourishing to the skin and won’t strip away good oils the skin needs to actually fight bacteria. When the skin becomes too dry and undernourished, harmful bacteria can make their way into the pores. Dead skin from dryness can cause bacteria to fester, which in turn can lead to acne. Using harsh creams can create a vicious cycle that further dries the skin and makes things worse. Hemp oil is a better alternative and is also very alkaline — it’s naturally cleansing and will remove impurities while still being gentle. To use as a makeup remover, apply a teaspoon of hemp oil to a cloth and pat around your eyes first to gently rub away your eye makeup. Then, rinse the cloth a few times and apply another half a teaspoon of oil to the cloth, rubbing together and squeezing out the excess water. Wash the rest of your face removing your makeup as normal. Rinse and use a toner, such as apple cider vinegar, as needed. Pat dry. One of the best things about hemp oil is that it’s easy to apply. It also has an amazing scent that’s so much better for you than toxic, chemical-based perfumes. The smell is somewhat earthy and nutty — it’s extremely refreshing after a bath or shower. Hemp’s scent also has a naturally calming effect, much like eucalyptus and rosemary. There are a few major brands of hemp oil on the market, most of which are a high quality, but you’ll still want to be careful. Avoid flavored hemp oils if you happen to come across any, and also those that contain preservatives or additives. You’ll want to look for raw, cold-pressed hemp seed oil that’s organic and non-GMO. You can find these online or at health-food stores. An eight-ounce bottle of hemp oil will last around one to two months, depending on how much you use it each day. Hemp oil that is consumed internally should be kept in the fridge because the oil has the potential to go rancid in a hot kitchen. If you use it in the bathroom, it should not go rancid as long as it’s kept in a cool closet or drawer. However, if your storage space is directly beside your shower, consider keeping your oil in a drawer or closet away from heat and steam. Using natural oils on the skin is a great way to promote natural beauty. Nature’s most amazing foods have the potential and power to keep us healthy, youthful and radiant. Which natural oils do you use in your beauty routine? Hey Buddy!, I found this information for you: "5 Ways to Use Hemp Oil in Your Beauty and Hygiene Routine". Here is the website link: https://www.thealternativedaily.com/use-hemp-oil-for-beauty-and-health/. Thank you.